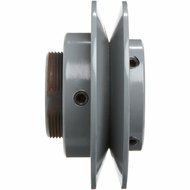 Increase efficiency, vary speed, and extend the life of your drive by changing the pitch on these cast iron pulleys. Turn the sides of the pulley on the threaded hub to increase or decrease the pitch. These pulleys are for use with 3L, 4L, 5L, section V-belts, also A-section and B-section V-belts, unless otherwise stated. They have one set screw and a standard ANSI keyway. 3.75" OD pulley with 1" bore size has two set screws. 1/2” bore size does not have a keyway. If you have any questions Contact Us.